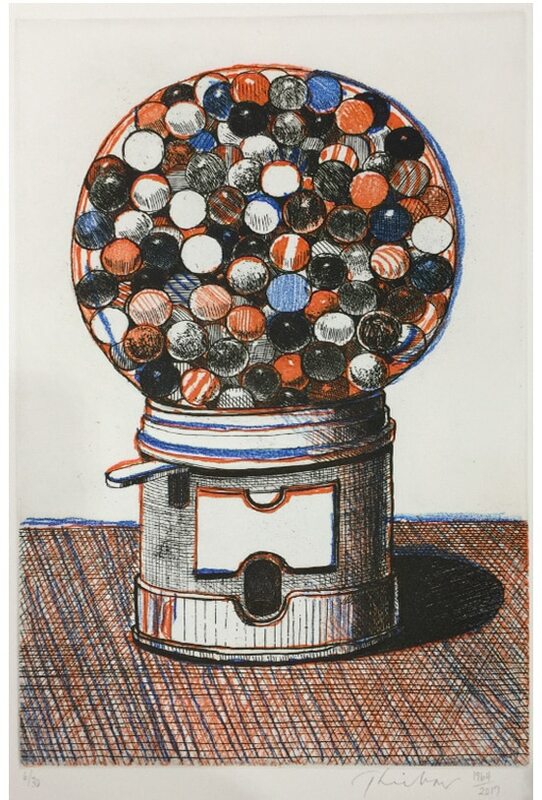 Wayne Thiebaud (born 1920) is an adored painter, draughtsman, and printmaker known for his richly saturated yet luminous still life paintings. His frequent depictions of sweets, delis, and desserts are described with thick, velvety paint that radiates the full spectrum of light. 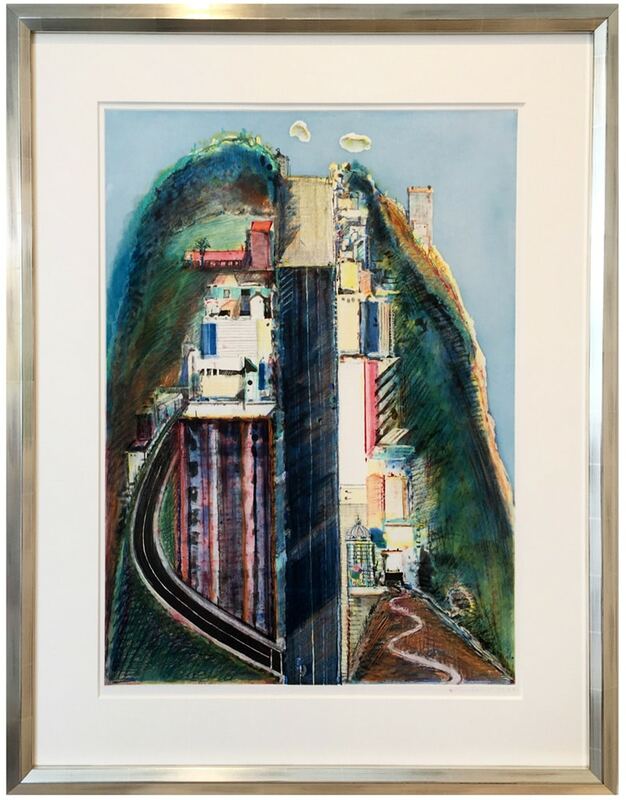 While renowned for his images of plenty—including cakes and pies—Thiebaud is also known for his unconventional landscapes, cityscapes and portraits. For over 40 years, Thiebaud’s practice has represented a completely unique expression that remains grounded in the American tradition. 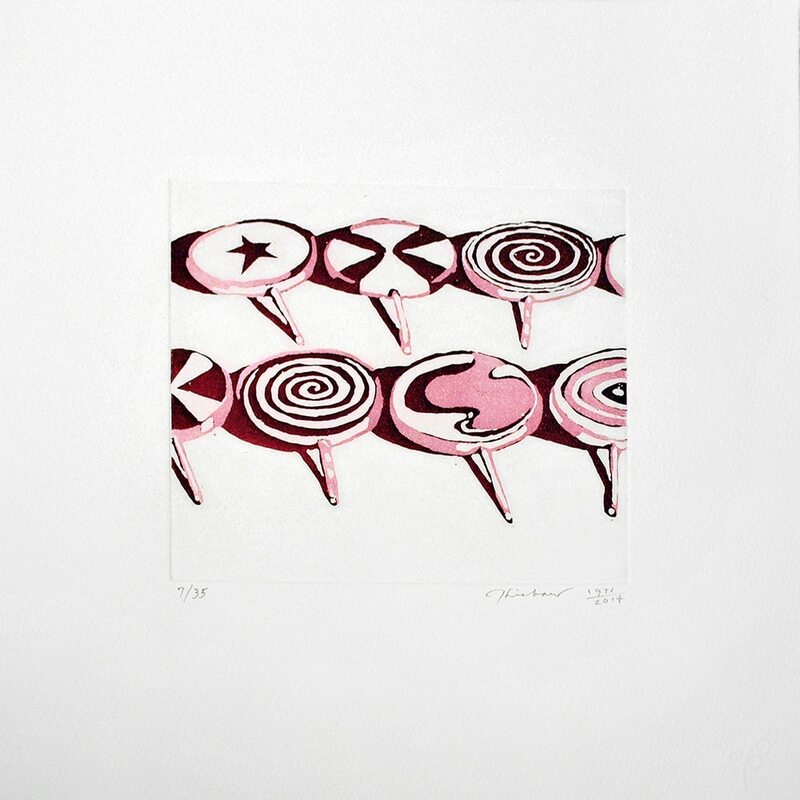 Although his works can appear witty and charming, their incorporation of abstraction and realism disarmingly evokes a connection to the sweeter things in life. Thiebaud has proclaimed that he merges the perceptual with the conceptual in a process in which he often paints from memory; perhaps this approach is what gives his paintings the quality of materialized dreams. Wayne Thiebaud was born in Arizona in 1920 and was raised in the Mormon church, with a father who was a bishop within the ward. 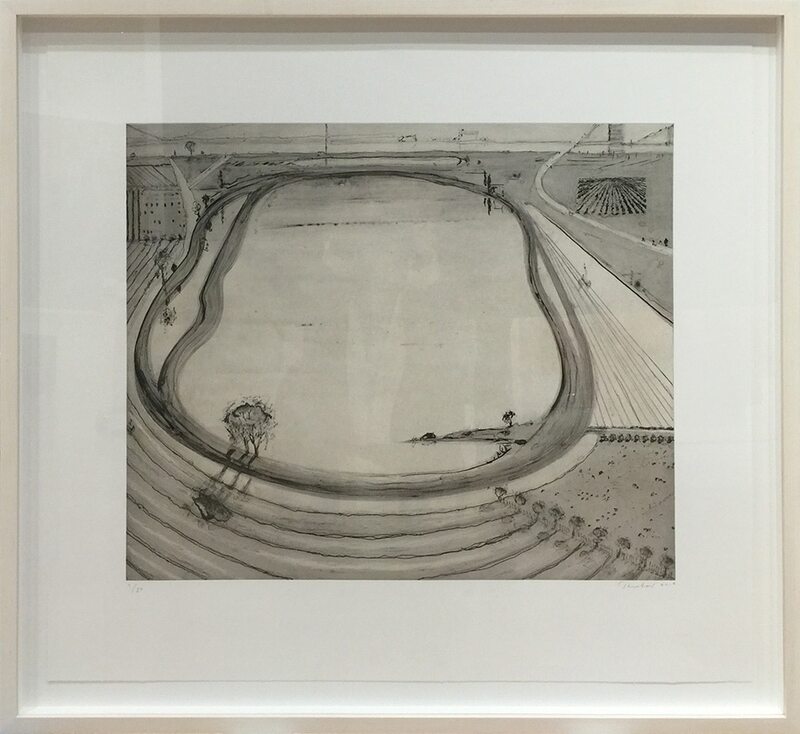 Thiebaud’s family moved to Long Beach, California, in 1921, and shortly after to Los Angeles, so his father could work for Gold Medal Creamery. 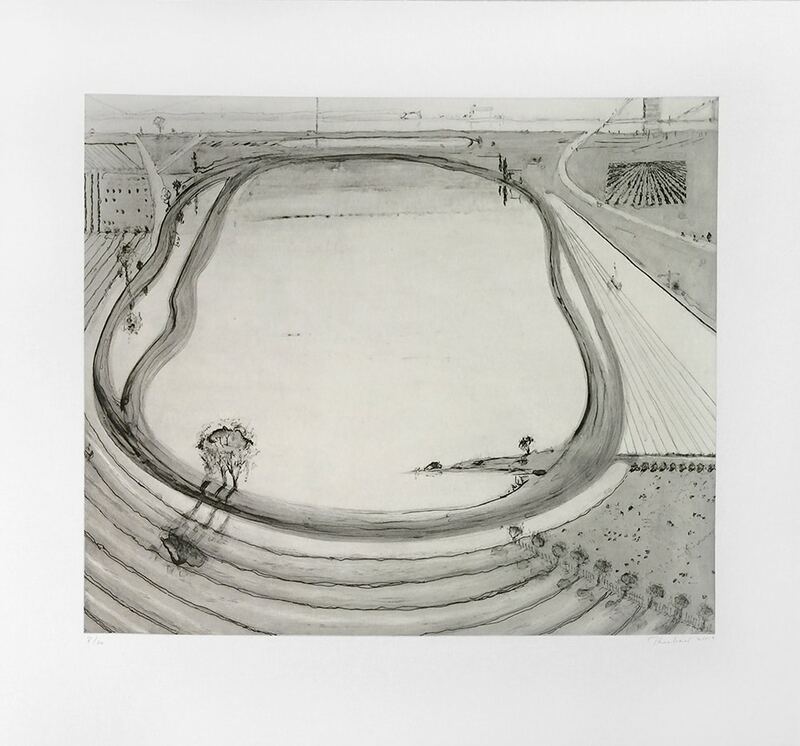 As a child, Thiebaud’s earliest exposure to art was through his cartoonist uncle and through his mother’s set up of art supplies, in order to keep the children occupied. Do to the onset of the Great Depression, in 1933, Thiebaud and his family moved to Southern Utah to farm. When his family’s farm failed, they returned to Long Beach, California. Thiebaud attended Long Beach Polytechnic High School in 1935. He first took up drawing, after breaking his back in sports. 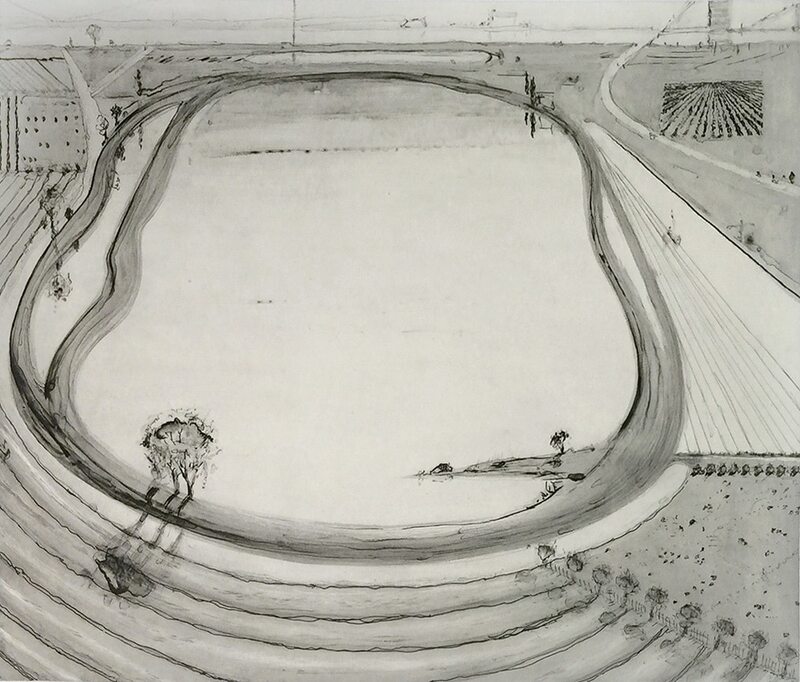 In 1936, Thiebaud worked at the Walt Disney Studios, Los Angeles, for a summer apprenticeship within the animation department. He then studied commercial art at Frank Wiggins Trade School, taking courses in fashion and graphic design. Through 1940, Thiebaud worked freelance jobs in the arts: cartooning, illustrating, and sign painting. From 1942-1945, Thiebaud worked in the air force, stationed near Sacramento, California. There he designed a cartoon for the newspaper called Wing Tips. After the war, Thiebaud worked both in New York and Los Angeles in several freelance positions related to art. 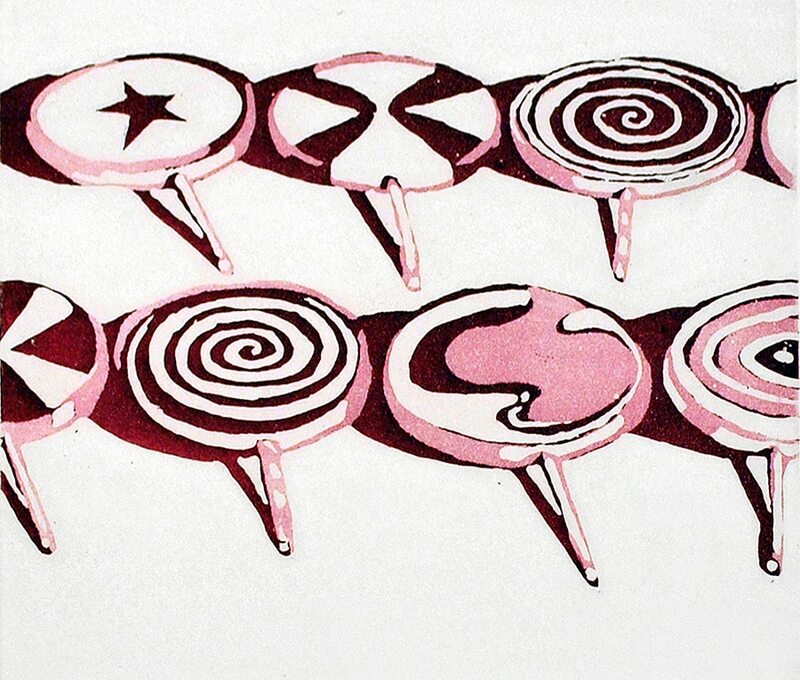 In Los Angeles, Thiebaud worked under Mischa Kallis, an art director at Universal Studios. There he had the opportunity to work on movie posters and set design. In the later half of the 1940s, Thiebaud was inspired by Robert Mallary, a coworker at a drug company called Rexall in Los Angeles. It was during the later half of the 1940s that Thiebaud seriously focused on painting. In 1948, he participated in his first major exhibition at the Los Angeles County Museum. In 1950, Thiebaud attended San Jose State College and later California State College at Sacramento, majoring in art. He also excelled in set design, working on several theatrical productions. By 1951 he earned his bachelor’s degree and also had his first one-artist exhibition at the E.B. Crocker Art Gallery called Influences on a Young Painter. Thiebaud instructed at Sacramento Junior College, while simultaneously working toward his master’s degree. There he taught art and art history, while exhibiting his own work. Thiebaud held many shows in the 1950s, ascertaining himself as a force in the art world. He also established the company, Patrician Films, which created educational art films. In the late 1950s, Thiebaud took a break from teaching and moved to New York City. There, he met Willem de Kooning, Barnett Newman, Franz Kline, and many other artists who are now well-known. During the 1960s, Thiebaud mastered his signature style of bright, lavishly painted items such as pies, cakes, and candy. It can be argued that his artistic approach influenced both the Pop Art and Photorealism movements on a profound level. However, his unique style continues to resist categorization. In 1962, Thiebaud had his first New York City solo exhibition at the Allan Stone Gallery. Also his works were exhibited amongst Pop legends: Andy Warhol, Roy Lichtenstein, and Jim Dine in the exhibition New Paintings of Common Objects at the Pasadena Art Museum, California. This important exhibition is now considered a pivotal moment in the history of Pop Art. 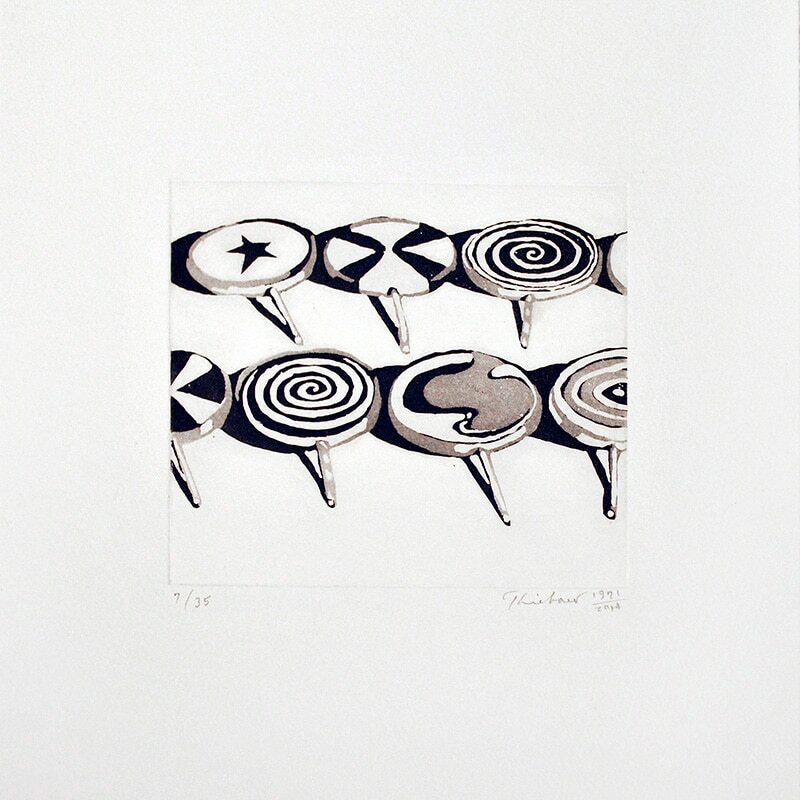 In 1963 he began working with Kathan Brown at Crown Point Press, creating an extraordinary group of etchings. Since then, his prodigious body of graphics has been recognized as a critically important segment of his career. Thiebaud continued his exploration of everyday objects after the ‘60s – the decade that launched his Pop career. 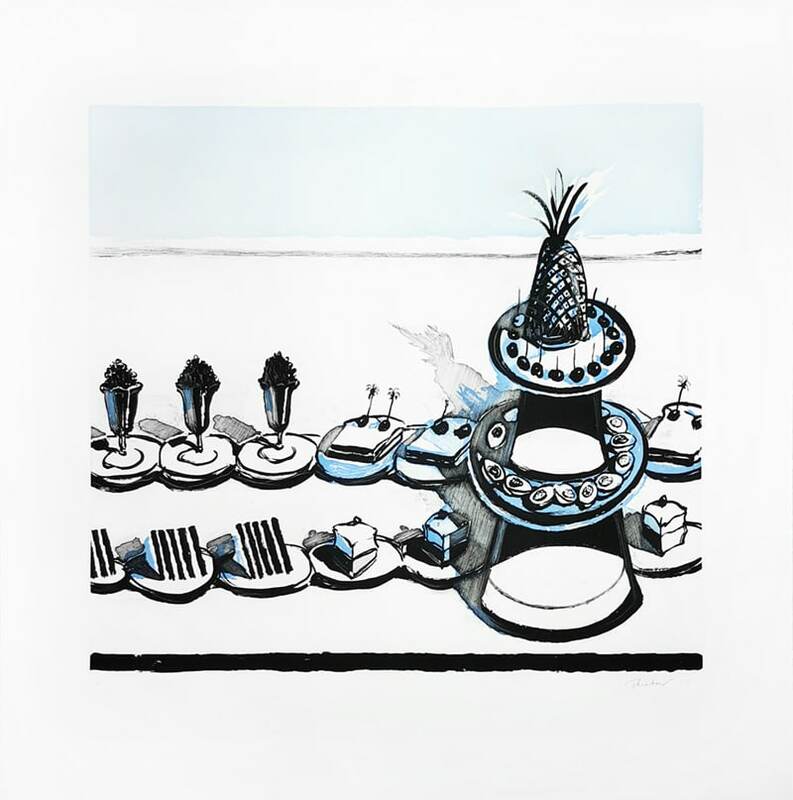 His work incorporated subject matter of shoes, lipsticks, dresses, ties, unconventional and exciting landscapes, and of course his traditional subject matter of pies, cakes, and candy. By 1968 he was given a solo show at the Pasadena Art Museum. The 1970s were a successful decade for Thiebaud. His work was exhibited in important institutions including the Whitney Museum of Art in New York City, the Phoenix Art Museum in Arizona, and The San Francisco Museum of Art. Thiebaud also honored with prestigious teaching award, The Golden Apple, from University of California, Davis. 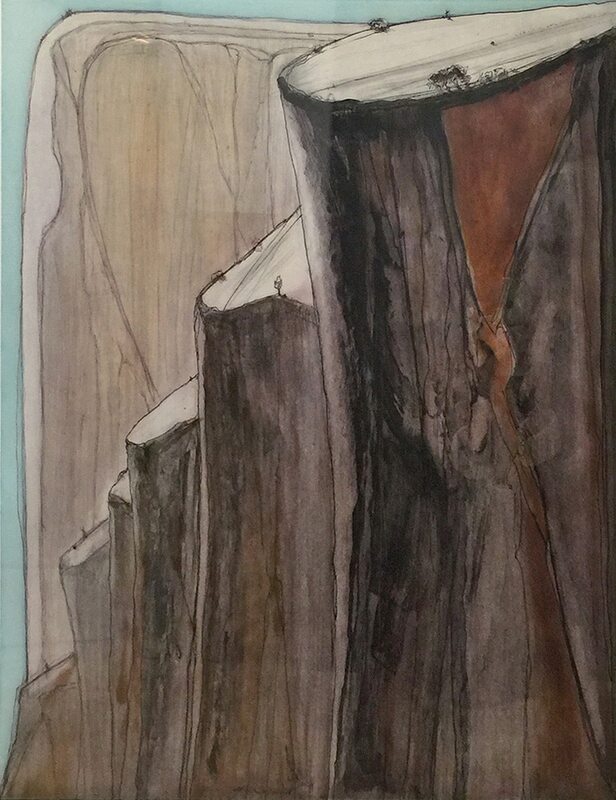 In 1975, he was commissioned to paint Yosemite Valley for the US Department. 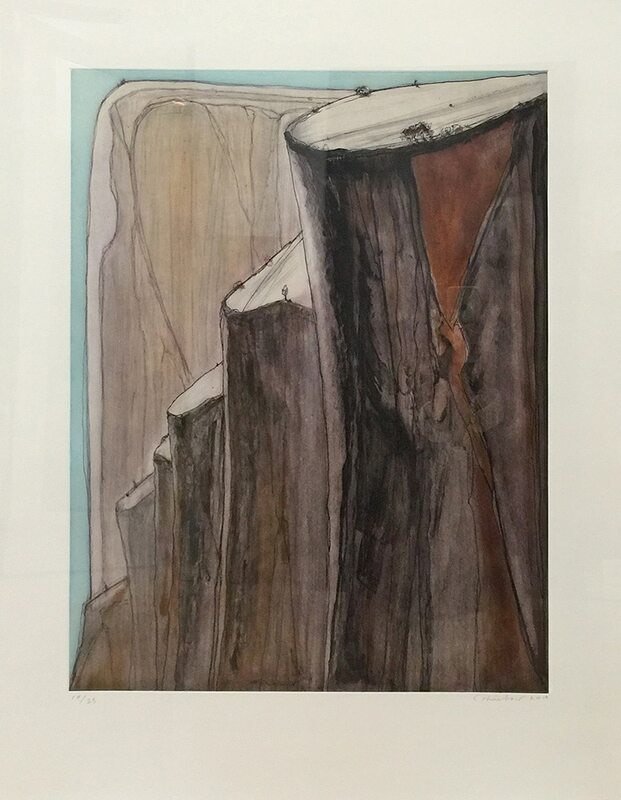 In the 1980s, Thiebaud received a plethora of awards: special recognition from the National Assosication of Art and Design in Virginia (1984), San Fracisco Arts Commision distinguished service award (1987), and Scholarly Achievement from University of California, Davis (1988). He also had a major retrospective at the San Francisco Musuem of Modern Art in 1985. Thiebaud received the California State University, Sacramento Distinguished Service Award in 1990 and shortly after, the Lifetime Achievement in the Arts award in 1991 in Beverly Hills, California. Thiebaud was also awarded the extremely presitigious National Medal for Arts award, presented by President Clinton in 1994. In the 2000s, to add to his beautiful oevre, Thiebaud painted colorful aerial views of countryside landscapes, many of which included water and agricultural references. Impressionist in nature, Thiebaud’s works often transported the audience into a realm of color, unlike that which exists in reality: pink lakes, buttery yellow fields, cotton candy crops, and thick, fantastic billows of fog. Thiebaud’s artwork continues to exhibit and delight the international art world. He lives and works Sacramento, California.